I'm performing a PCA analysis and I really like to visualize the correlations using the 'color map on correlations'. However, I would like to have my variabale labels' at the x and y of this graph (see attached image). Is there any way to do this? In multivariate platform or principle components platform, display the correlation matrix. Then right-click the matrix and select "Make into Data Table". 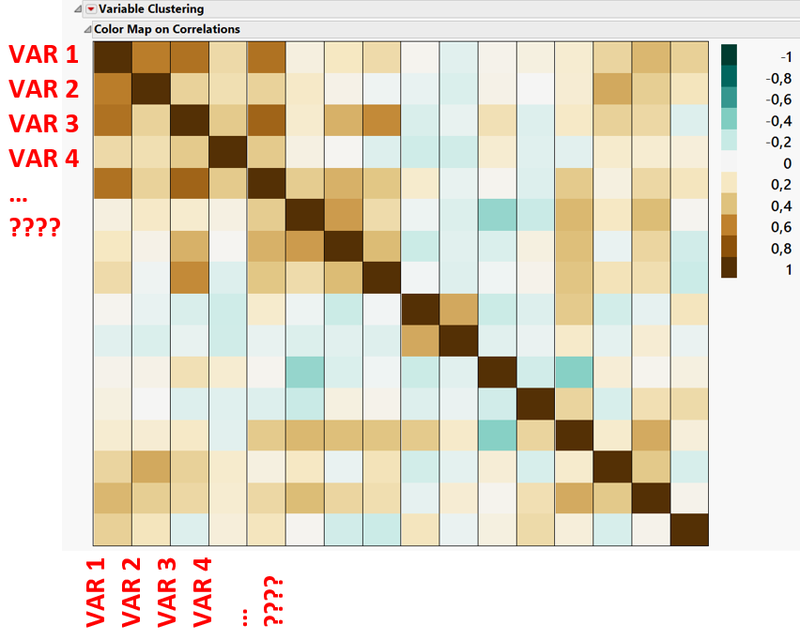 Use Tables > Stack to create a tall version of the table that 3 columns: A column with the variable names to use for categories on the X axis, another column with categories for the Y axis, and a column with correlation of the variables in the previous two columns. Now you can use the Graph Builder to create the heat map of these correlations. I did have to reverse the order of the variables on the X axis in the axis settings to get what you wanted. Here's a script that recreates all those steps on the sample data table ("Body Measurements.JMP") that I used to illustrate all of this.